Add a pop of color and excitement to your evening looks with those fun clutch bags. Fall’s juiciest arm candies are bright and ladylike. 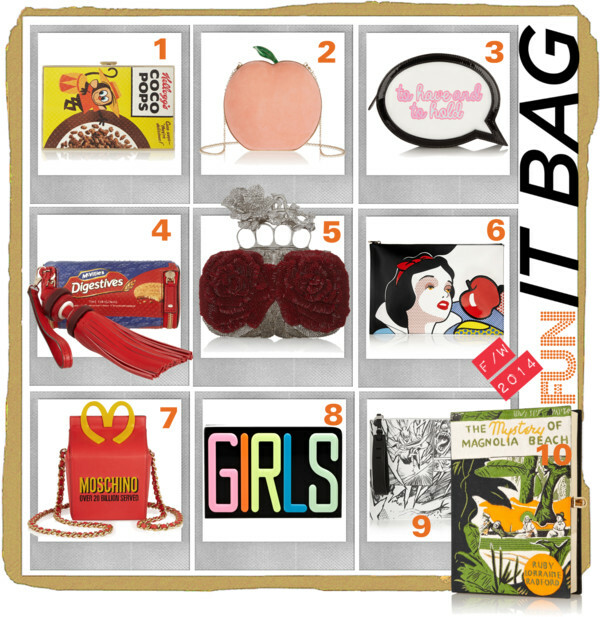 Either you go for Anya Hindmarch‘s bold graphics of household brands (1 and 4) or choose Charlotte Olympia‘s playful peach clutch (2) that is covered in suede perfectly mimicking the fuzzy texture of the fruit. I personally adore REDValentino‘s combination of fairy tales and fashion (6). All interiors offer enough space for your party essentials.